This is the first post about my recent trip to Sudan. 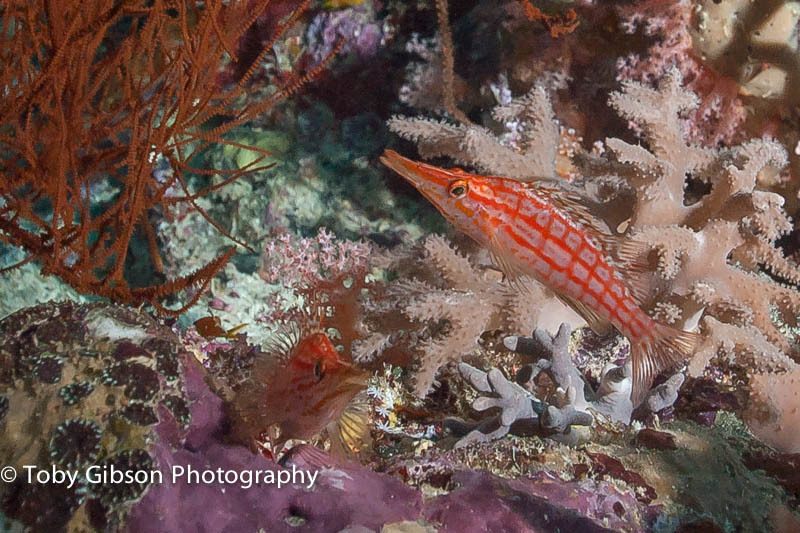 I saw this pair of Longnose Hawkfish – Oxycirrhites typus amongst black coral off the South West tip of Sanganeb Reef. Hawkfish are normally solitary, and some of the other species are well known to underwater photographers as they tend to sit still on coral outcrops, making them a pleasing subject. However, this pair were very much together and pretty active, swimming in circles, and chasing each other through the black coral. Black corals are from the family Antipatharia, and really stand out amongst corals, as they look more like plants or bushes. In this particular area of Sanganeb reef there were a lot of patches of black coral. Longnose hawkfish are well known to live in black coral, so my expectations were high to find them on this reef. I wasn’t disappointed – I actually saw another pair, but they were not in a position to photograph. I had my wide angle lens on, in the hope of seeing some sharks and large shoals further up the reef, so it was a little tricky to photograph these small fish, and I have had to crop the images a bit. The images were taken with a Nikon D70, 12-24mm lens and twin Inon Z240 Strobes in Manual mode.